Welcome back! How is your quick start going? I hope if you’ve had any troubles that you have reached out to me or David. This is what we love to do, help you be successful! Today’s video is short. 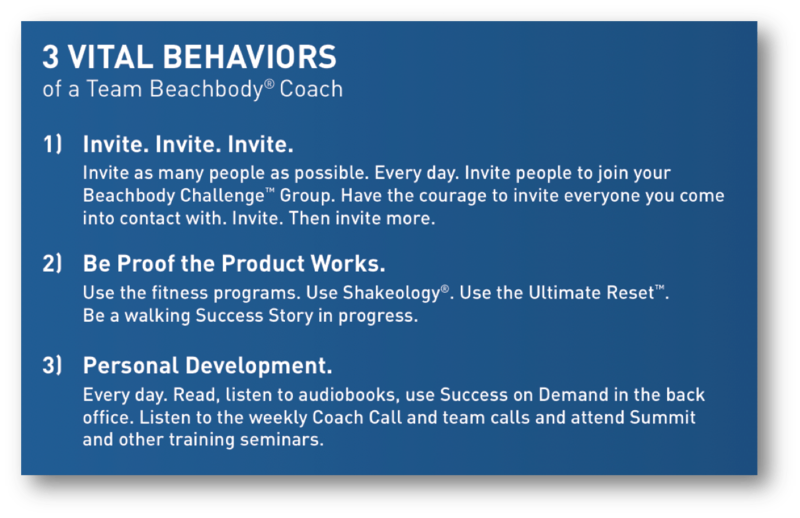 I will give you a quick overview of Beachbody’s 3 Vital Behaviors for Coaches. I will link some more information at the end of the post if you want to dive a little deeper. As you’ll see in the video, these behaviors help you build relationships with people. Like almost all businesses, your success as a coach will largely depend on your ability to build real relationships with people. What’s great is that is why most of us are coaching! We want to help people. Be a Product of the Products – Credibility and authenticity. Why would I trust you about Beachbody products if you don’t use them yourself?